A fluid–solid-growth (FSG) model of saccular cerebral aneurysm evolution is developed. It utilises a realistic two-layered structural model of the internal carotid artery and explicitly accounts for the degradation of the elastinous constituents and growth and remodelling (G&R) of the collagen fabric. Aneurysm inception is prescribed: a localised degradation of elastin results in a perturbation in the arterial geometry; the collagen fabric adapts, and the artery achieves a new homeostatic configuration. The perturbation to the geometry creates an altered haemodynamic environment. Subsequent degradation of elastin is explicitly linked to low wall shear stress (WSS) in a confined region of the arterial domain. A sidewall saccular aneurysm develops, the collagen fabric adapts and the aneurysm stabilises in size. A quasi-static analysis is performed to determine the geometry at diastolic pressure. 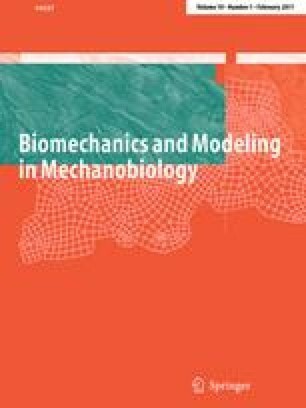 This enables the cyclic stretching of the tissue to be quantified, and we propose a novel index to quantify the degree of biaxial stretching of the tissue. Whilst growth is linked to low WSS from a steady (systolic) flow analysis, a pulsatile flow analysis is performed to compare steady and pulsatile flow parameters during evolution. This model illustrates the evolving mechanical environment for an idealised saccular cerebral aneurysm developing on a cylindrical parent artery and provides the guidance to more sophisticated FSG models of aneurysm evolution which link G&R to the local mechanical stimuli of vascular cells.